In anticipation of the approaching Central American migrant caravan, US Customs and Border Protection (CBP) announced that work began on Tuesday to "harden" the border crossing between Tijuana, Mexico and San Diego. 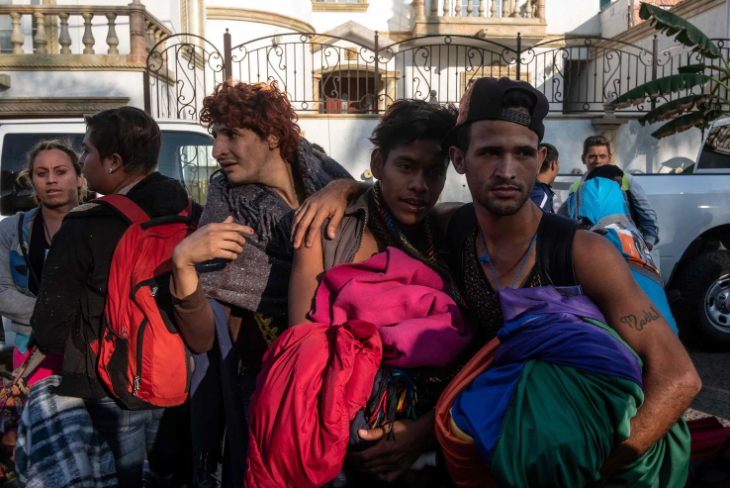 The work comes as the first wave of migrants arrived in Tijuana Monday; approximately 80 gay, lesbian and transgender asylum seekers who were bussed ahead by an anonymous organization after they say intolerant fellow asylum seekers were harassing them. Apparently the caravan is full of bigots who can't wait to get into the United States. "They experienced a lot of violence, including having the shelter they were staying in robbed and set on fire," said immigration lawyer Nicole Ramos. "They are vulnerable." A second group of 360 migrants made it to Tijuana on Tuesday morning. CBP closed four lanes at the heavily trafficked San Ysidro and Otay Mesa ports of entry in San Diego in order "to install and pre-position port hardening infrastructure equipment in preparation for the migrant caravan and the potential safety and security risk that it could cause," according to CBS News and PBS. 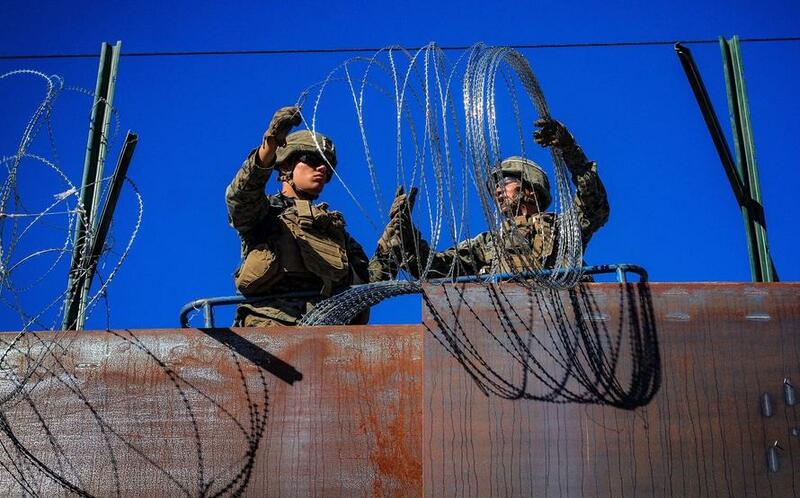 On Thursday, 1,100 Marines from Marine Corps Base Camp Pendleton in California were deployed to support border security, CBS San Diego affiliate KFMB reported. They were primarily tasked with installing concertina wire and pre-positioning jersey barriers, barricades and fencing. The thousands of Central American migrants left shelters in Guadalajara early Tuesday and were taken by bus to a highway tollbooth to wait for rides to their next destination. Most appeared intent on taking the Pacific coast route northward to the border city of Tijuana, which was still about 1,350 miles away. The migrants have come about 1,500 miles since they started out in Honduras around October 13. While the caravan previously averaged only about 30 miles a day, the migrants are now covering daily distances of 185 miles or more, partly because they are relying on hitchhiking rather than walking. "CBP has been and will continue to prepare for the potential arrival of thousands of people migrating in a caravan heading towards the border of the United States," said Pete Flores, CBP's director of San Diego field operations. 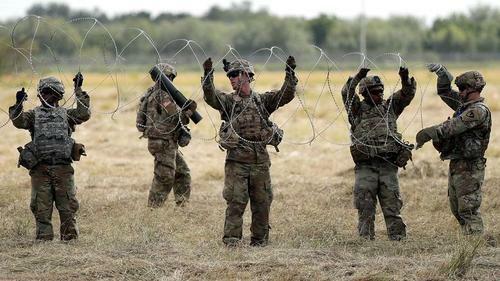 In Texas, meanwhile, approximately 5,600 troops have laid approximately 1,000 feet of razor wire fencing along the Texas side of the Rio Grande river underneath the McAllen-Hidalgo International Bridge, as soldiers work to support US Customs and Border Patrol efforts to prevent the asylum seekers from entering the country. The first groups to arrive in Tijuana were served breakfast before walking toward the beach to look for a place to remain until they attempt to cross into the United States. Tijuana Municipal Migration Affairs Office director, César Palencia, said that there is enough shelter space for 900 migrants in the city, however they still need more mattresses, blankets and clothes for new arrivals. Palencia is concerned that there won't be enough resources for the large group of at least 3,000 migrants expected in a couple of weeks. "We are expecting more of these little groups, but we don’t know right now exactly what we are going to do with the big caravan," he said. "But we will make room." Meanwhile, some of the LGBT migrants have received a tepid welcome from Tijuana residents. "A few of the migrants left to go buy a couple of things, and they were harassed and insulted in the street," said Alvarez. The rest of the migrants are expected to trickle in over the next few weeks, unless anonymous organizations bus them to the border sooner.